Years that add up to #9 are represented by the Hermit. During the Hermit Year, questions of the spirit drive you to look within yourself to find your way. Though you might find you’re happiest alone these days, you rarely turn people away who are seriously looking for advice. And they often appear this year. In their search for truth, you encourage others to look within, just as you are trying to do. You’re encouraged to have faith in what you know from experience – your own and those of others you trust. This is a great year to gather your thoughts and build your spirit. It takes time and patient silence. But it’s well worth it. 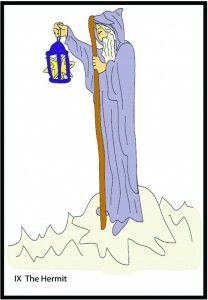 The shadow symbol for the Hermit is the Moon.